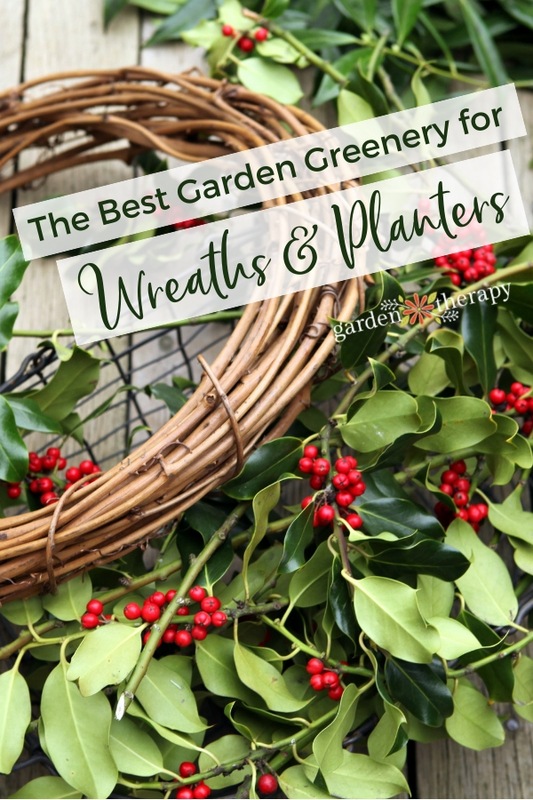 There is no need to look any farther than your own garden for the best greenery for holiday decorating. Right outside your door growing in your garden, neighborhoods, and parks are shrubs, trees, and perennial plants that would be very happy to share a few branches with you for seasonal enjoyment. 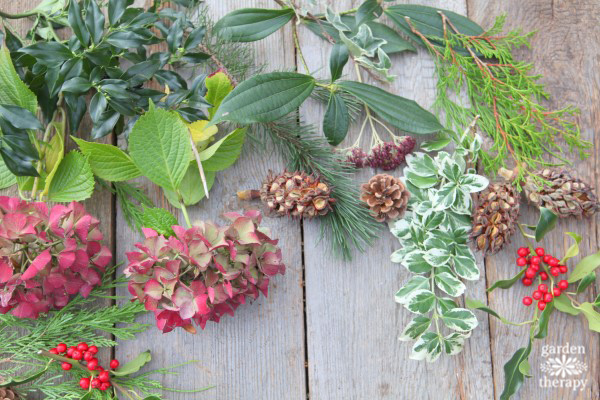 This will guide you through some of the garden greenery for holiday decorating based on appearance and longevity, and also which ones you should avoid. 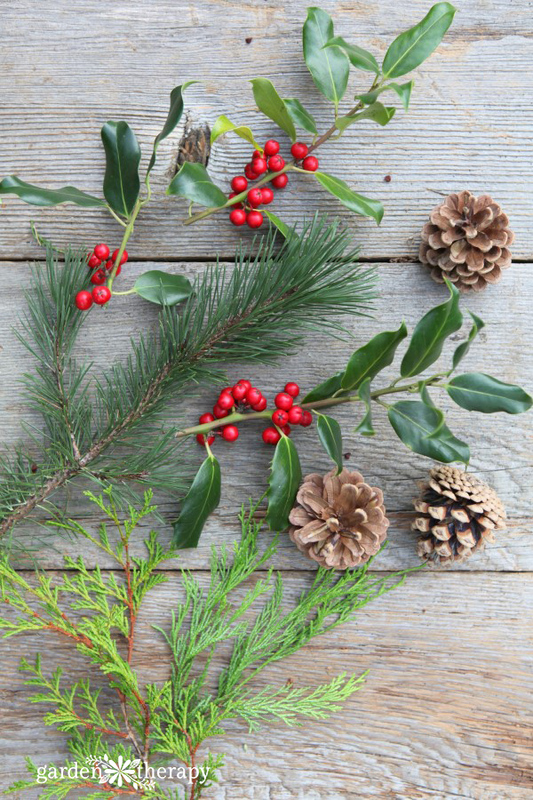 Holiday greenery is not limited just to evergreens, and it’s not always green! 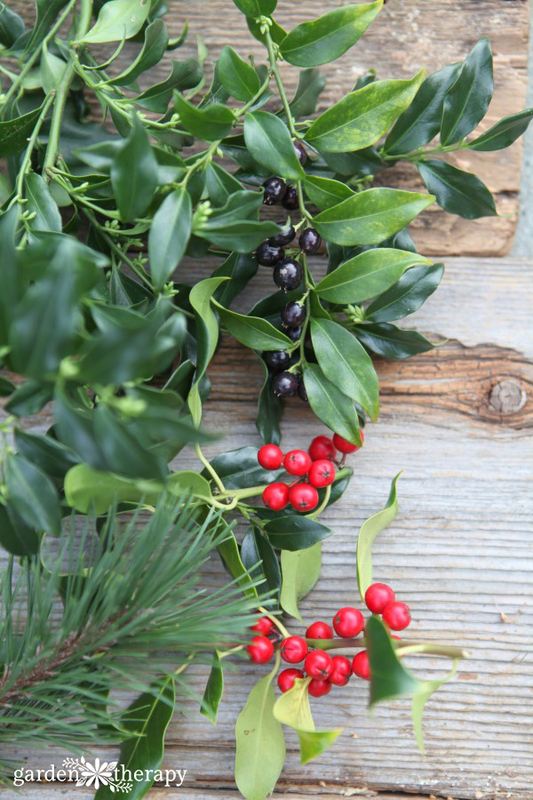 Some of the most beautiful holiday arrangements include both needle and broad-leaf evergreen foliage, as well as perennial flower and seed heads, herbs, and branches. When harvesting greenery from your garden, it’s important to follow the basics of pruning to maintain the overall health of the plant. Take care to remove branches from trees and shrubs as if you were thinning the structure. This will help to retain the beauty of the plant in the landscape. Perennials that have dried in the garden can be cut back completely without any issues. Cut these needle-leaf evergreens from well-established tress/shrubs. The branches should be firm, cool to the touch, and full of green needles. Avoid those that are browning, yellowing, shedding needles, or have obvious signs of disease and pest problems. 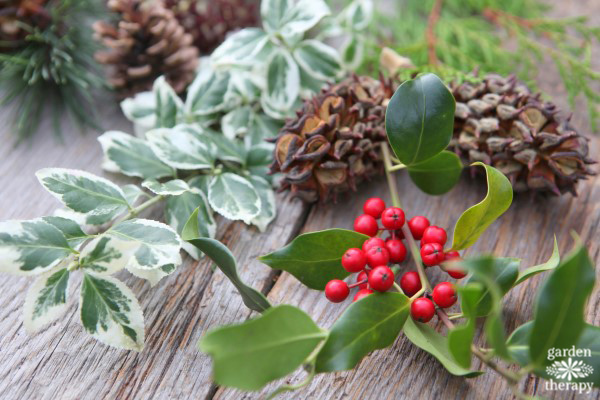 Broad-leaf evergreens add a different texture and a whole lot of color to holiday arrangements. These are some of my favorites. 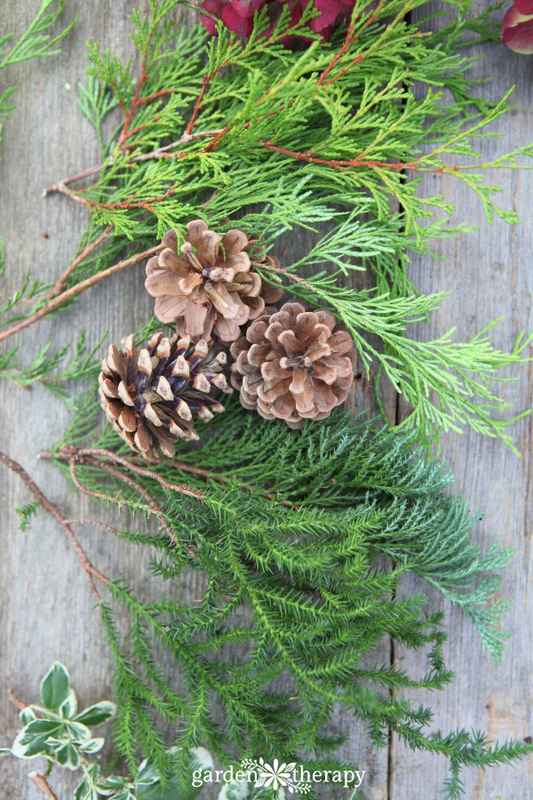 Herbs are a fragrant addition to holiday decorating and compliment the other elements well. Perennials that have flowered and dried in the garden can provide beautiful additions to a wreath or garland. When the holiday season comes around, you’ll be happy that you didn’t cut these back! Any branches that look beautiful in the garden would look lovely in holiday decorating as well but there are a few that are extra special. Red and Yellow Twig Dogwoods have bright-colored branches that glow in the landscape as well as in arrangements. Curly willows and Harry Lauder’s Walking Stick add festive curled branches. Branches with colorful berries are worth adding into arrangements. Notably, holly (red), snowberry (white), Cotoneaster (orange and red), and beauty berry (purple) have berries that can’t be beat. There are some types of garden greenery that it is best to avoid, as they won’t last long enough to enjoy in arrangements. Yew looks pretty in the garden but it will shed its leaves within a day. Norway spruce is a popular Christmas tree but it’s also the one that sheds needles the fastest. Boxwood is probably one of the most popular broad-leaf evergreens for holiday decorating, but I only use the variegated varieties. Many of the common green varieties smell terrible (like cat urine) and that isn’t something that I want on my door or holiday table. Finally, be sure to look for greenery that is free from pests and diseases. If there is debris leftover from the growing season, you can always give the sturdier cuttings a wash with the garden hose. Did I miss any? If you have any garden greenery for holiday decorating that you love or avoid, please leave a comment and share your thoughts. There are so many materials to work with out in the world—especially in differing climates—and I’m always learning new ones that work (and don’t). Now that you know what to cut, here is what to make! Hi, Stephanie! As usual, a great article. How I miss having access to “wintery” plants this time of year! Here in Brazil, we have pines and such, but they typically look completely different. I usually decorate with bromeliads and other plants that you have as houseplants! In fact, I’m in the process of writing a post about festive tropical plants to use as holiday decor… should be on my blog by Monday, Dec. 12!